I returned to Seminole State College to see "Spring into Dance" presented by Yow Dance. I requested a seat in a back row with no one near by. I didn't want the glow from my tablet to disturb any audience members. The Artistic Director, Eric Yow was seared a few rows in front of me. The performance was a collaboration between Eric's dance company and some very enthusiastic College students who were studying modern dance under Eric's supervision. There were a total of eight dance pieces. Some were so high energy, like Word Up, that I was amazed by the stamina of the dancers. The dancers wore blood splattered wedding dresses and moved with zombie like loose muscled fluidity. The stage lighting gave the dresses an eerie iridescence. This was the world premiere of this piece and the audience loved it. 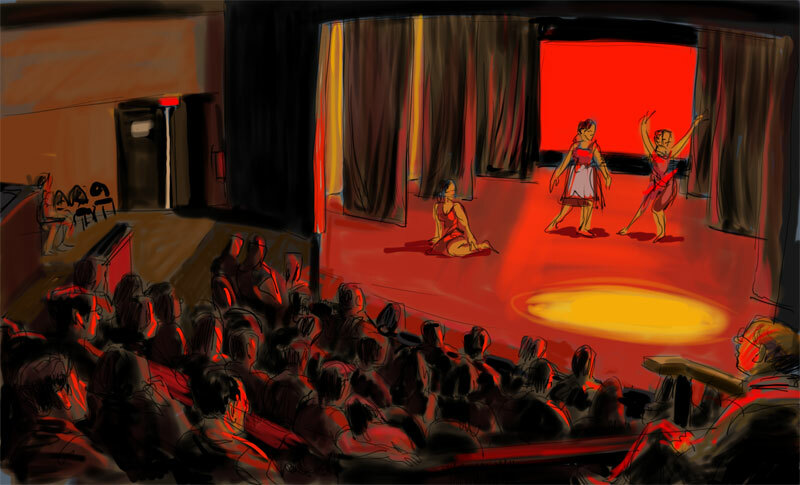 In one piece the dancers interacted with a lone spotlight. They would dance close to the mysterious light with tentative trepidation. By the end of the dance they formed a human pyramid allowing one lone dancer the chance to reach up to the illuminated heights. The last piece was called Blackberry Winter. It was an inspired incessant driving piece that kept a face pace throughout. Groups moved together in unity and just as an action felt complete another group would spiral into action. Do you always use a tablet for drawing sketches for your blog? I tend to just use the tablet in low light or no light situations.